The Princess of Darkness. Former NFL team executive Amy Trask has held many titles during her career – including chief executive, analyst, and author – but this nickname is what she is first and foremost known by to Raiders fans. Trask joined the Raiders as an intern during law school after the team moved from Oakland to Los Angeles – the position the result of a cold call she made to the team. From there, she worked her way up through the ranks of the organization, to the post she would eventually hold as chief executive. Along the way, Trask worked extremely closely with the late Al Davis, a man who treated her and others on his team without regard to gender, race, and age. 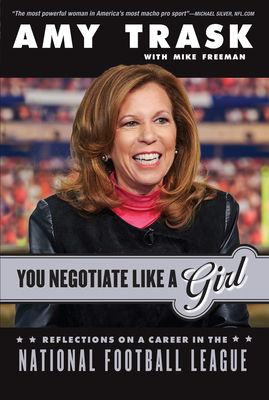 Trask may have been the highest-ranking female executive in the NFL during her tenure with the Raiders, but in You Negotiate Like a Girl: Reflections on a Career in the National Football League, she shares how she found success by operating without regard to gender. Replete with insider tales about being part of the Raiders' front office, behind the closed doors of NFL owners meetings, and Davis himself, Trask's book is a must-read not only for football fans, but anyone who wants to succeed in business. Amy Trask is an analyst for CBS Sports and CBS Sports Network. She appears regularly on That Other Pregame Show and We Need to Talk and periodically on NFL Today. She is the former CEO of the Oakland Raiders. Michael Freeman is a football columnist for Bleacher Report. He has previously been a writer for CBSSports.com, the New York Times, Washington Post, Boston Globe, Dallas Morning News, and Florida Times-Union. He is the author of eight books. His latest book, Two Minute Warning, was published in 2015.